People are now hitting up the Internet for dating more than they are meeting in person. So, you need to know what are the best online dating sites so that you can find the best dates, right? That is why we are here today: To review with you the top online dating sites so that you can choose wisely. We all know about the four hundred pound Gorilla in the room: Match.com. They have been the leader in the online dating market for many years now. But are they the best? Should you just go straight there for your online dating experience or should you try some others? And, before you delve into this online dating arena, is there anything that you should be aware of in this world of Internet dating. As we look at the best online dating sites, you may want to review the Online Dating 10 Commandments. This article reviews with you some tips about online dating that may not be in the forefront of your mind. First and foremost, you must put a picture up with your profile or you will not get very far. All of the online dating authorities rank this as the number one thing for people to be aware of. While you may want to keep your photo anonymous to protect your identity, there is simply no way around it. People who do not post a picture with their online dating profile simply do not get online dates. So, get your photo together, take heed of the 10 commandments of online dating, and then choose from one of the best online dating sites below. When you take a look at online dating sites, you often get big long lists of sites that you can try. This can be annoying because you simply want to go with one or two. How do you choose? Well, you will find sites that rank online dating websites and then you will find other sites that rank them differently. It can be a minefield, but we are going to remove the challenges and tell you exactly what to do. If you do not mind paying a fee and you want to date, sign up for Match.com–try it out with this Match.com 7-day Free Trial. It’s still the biggest and the best. If you are looking for a serious relationship and want to get straight to it, sign up for eHarmony. The best free online dating website by far is OkCupid.com. If you do not want to pay (or even if you are paying for the ones above), we recommend this site as the best free online dating website. You often will not see OkCupid on lists of top dating sites because of the very fact that they are free. You see…web sites who link to a paid dating site get a portion of your sign-up fees. And, since OkCupid is free, these websites do not get a cut of the action. Thus, their incentive to recommend OkCupid is removed. However, OkCupid is easily the best free dating site and is worth signing up for because it costs nothing and is very good. Now that we have presented you with our online dating site recommendations, let’s commence with a list of the top 10 dating websites. We, of course, will start with the ones that we have just mentioned above because we feel that they are the best. Here are reviews of the top ten dating websites. Match.com continues to the biggest and the best with over 15,000,000 subscribers. This is a lot of people to choose from. There site is extremely well organized, in a manner that many view is akin to facebook.com, and they cater to a diverse population. You can sign up for Match.com for free and browse the profiles but to communicate with others you will have to sign up for their service. And, compared with other online dating services, Match.com is relatively inexpensive. Match.com also provides compatibility matches so that you can narrow down your list of candidates. However, unlike eHarmony, Match.com does not use in-depth compatibility tests to find your perfect mate. At the Best List Online, we choose Match.com as #1 for those who don’t mind paying a little to have a lot of online dating successes. And, we feel that Match.com nudges out our choice #2, OkCupid.com, because a paid service has a built-in filter that free sites do not. Do you know what we mean? OkCupid.com is the fastest growing free online dating website and they boast that they are “The best dating site on Earth“. 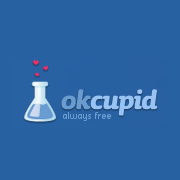 Obviously, one of the best perks for online daters with OkCupid.com is that they are free and very easy to sign up for. While a paid online dating membership site has its built-in advantages (the sign up fee serves as a filter), a free one does as well. You will hear claims of inflated and fake memberships for the paid dating sites in an effort to get new signups. Their goal is to boast as many subscribers as possible and make money. OkCupid needs to make no false claims as they are free to begin with. Thus, you can believe that most if not all of OkCupid.com members are actually real people. In fact, the owner of OkCupid.com runs a blog where he writes an article called Why You Should Never Pay For Online Dating which is worth a read. There, he explains the inflated subscriber numbers associated with paid sites. Bottom Line: You should definitely sign-up for OkCupid because it might just be the best option out their with real, living, breathing people. eHarmony is easily the best online dating website if you are seriously in the market for a long term relationship. eHarmony has about 1.75 million members per month who are paying about $60 each month for the services. These people want long term relationships and are willing to pay for it. While other online dating sites have questionnaires, eHarmony takes this to a new level asking you all sorts of seemingly obscure questions. They do this to apply their scientific, in-depth compatibility match. In the end, it seems to work as eHarmony has become the definitive site for those who would like a long term partner and are willing to pay for it. While we recommend the top 3 online dating sites above, they are not the only ones in the game. There are many more online dating sites from which to choose, some of which charge a fee and others that are free. Let’s take a look at 7 other online dating sites that you may want to consider. 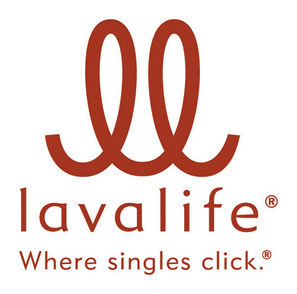 LavaLife earns our award for one of the best pitch phrases in the industry: “Where Singles Click”. We like how LavaLife breaks dating down into a few different categories: dating, relationships, and intimate encounters. All of us want different things from the online dating world and many of us want these different things at different times in our lives. It’s nice to have one service that covers all of them. Like most of these sites, you can sign-up for LavaLife for free but it will cost your $29.00 to really participate. Yahoo! Personals has one sure thing working on its side: history. Since they have been in the online dating game for such a long time, they boast over 10 million subscribers. However, they are not free. It will cost about $29 and up to truly experience Yahoo! Personals. One particular advantage with the Yahoo Dating website is that, like the Yahoo search engine, they are international. Thus, if you are a world traveler, you may want to check them out. Plus, it’s free to try for 7 days if you want to take Yahoo Personals online dating for a spin. i was on plenty of fish for about 2 weeks and after meeting a few men i definitely found my soulmate. crazy!!! 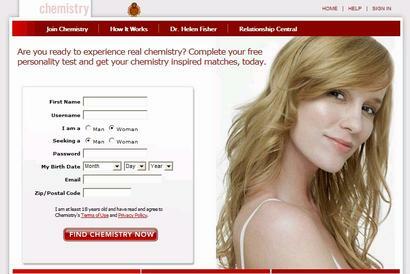 Chemistry.com is formula dating much like eHarmony.com. Through questionnaires and scientific measurements, Chemistry.com will match you with your “perfect mate”. One of the primary differences between the two is that eHarmony is only for heterosexuals while Chemistry.com does not have these restrictions. When you sign up for Chemistry.com, you fill out a questionairre and then you will be sent 5 of the “best matches” that Chemistry.com has selected. Of course, if you want to contact them, you will have to pay the subscription fee. Fees range from $49 a month to as low as $29 if you pay for an annual subscription. “Don’t Let Love Pass You By” is the slogan for date.com. Date.com boasts over 5 million members and a more international clientele. Worldly travelers looking for a love may find a home at Date.com. Date.com is structured similarly to other dating sites in that you can sign up for free but have to pay for actual participation. Date.com, as well as being international, focuses on big cities. If you are a big-city dweller, this may be a sight of interest for you. The DateHookup site has the goal of being the place for singles to meet other singles without having to pay a membership fee. We like that goal. However, the one thing that pay sites do is prevent the bottom feeders from invading their territories. DateHookup does its best to avoid this fate. It has become a site known for its youthful membership and fun vibe. Plus, it’s totally 100% free. If you are the young, fun type, and want to save your money for actually dating instead of signing up for online dates, this is definitely a site you may want to consider. You have probably seen their ads pop up from time to time. If any place overadvertises, it is FriendFinder. However, one benefit of this is that they have attracted many members. Currently, FriendFinder has over 2 million members and counting. FriendFinder can be a very fun place to interact with all types of individuals in many different ways such as blogs, networks, and interest groups. It is not exclusively for dating as they boast “Personals for fun, friends, and love”. Subscriptions to FriendFinder.com work like everywhere else: free to try but you have to pay to participate. We are amazed by the amount of online dating sites that exist and you probably are too. We have brought you 10 of the most popular dating sites but the list could have been expanded to 100. There are that many online dating sites. Well, rather than have you shuffle through the 10 best dating sites that we have listed, we have provided you with a course of action should you choose to take it. Step 1: Whether you are looking to date, or find long term love, sign up for OkCupid.com because it is the best free online dating site. Then, if you do not mind paying a small fee for love, do step 2a or 2b depending on your status. Step 2a: If you are looking to date and maybe find the love of your life, sign up for Match.com. Step 2b: If you are looking for long term love, sign up for eHarmony. But we realize many of you like to experiment and so we have brought you a comprehensive list of the Top 10 Online Dating Sites. If you enjoy the online dating game, you will probably want to explore all of them as they all have free sign-ups and browsing to suit your exploratory curiosity. Finally, remember this: Paid online dating sites have an incentive to falsely inflate memberships. So, if you find that you email someone and get no response, it could simply be that there is no real person behind the picture. And one last thing…visit the site eDateReview.com to read real stories and experiences from live members of all of these sites. We hope that you have enjoyed our article on the Best Online Dating Sites and that you visit our site often when you want to know what’s best.